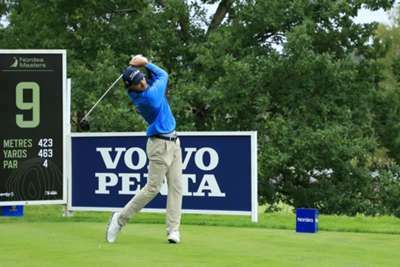 Clement Sordet made the most of a superb start and claimed the opening-day lead at the Nordea Masters, as Ryder Cup hopeful Thorbjorn Olesen overcame a dramatic build-up to begin the tournament in solid fashion. European Tour rookie Sordet, the world number 315 and a four-time winner on the Challenge Tour, birdied the first four holes at Hills Golf Club in Gothenburg en route to an eight-under 62. That put the Frenchman two clear of Scott Jamieson and Lee Slattery, with Christofer Blomstrand, Tapio Pulkkanen, Richard Green and Hunter Stewart a shot further back. Olesen, meanwhile, began the week with a 68, having seen his preparations disrupted by two sets of golf clubs going missing on flights. The Dane, who is just outside the automatic qualification spots for Europe's Ryder Cup team, was reunited with his clubs on Wednesday and finished strongly in round one, birdieing the 17th and 18th to reach two under. Olesen is the highest-ranked player in the field this week and will surely view the tournament as a huge opportunity to boost his hopes of making Thomas Bjorn's line-up. Former Ryder Cup star David Howell began his 600th European Tour appearance with a 71. He is the 10th player to make 600 starts on the tour, joining the likes of Colin Montgomerie, Sam Torrance and Miguel Angel Jimenez. The numbers behind Howell's appearances.